Chic on a Shoestring Decorating: Someone stole my photo, now I need your help! Someone stole my photo, now I need your help! Something lame happened to me. Someone stole one of my pictures from my blog, photoshopped it, then put it on a popular flash sale website to sell their product. If they just would've asked me I probably would've let them use it with the proper photo credits. Here's what they did, stole my photo shown below (left), then cropped my blog name off the pic and used a photoshop like program to put their printable they were selling over the center train picture on my son's wall. So here's how it went down. My friend was like, "Hey, I saw your son's room on Holly Mathis Interior's Pinterest page, isn't that cool?! But it didn't lead back to your blog??" I was all like... oh, Holly Mathis Interiors... wow, I'm flattered! And, then I went and looked at it, saw that it didn't lead back to me and realized it was stolen and photoshopped. I was able to trace my photoshopped image back to flash site jane. I sent them an email but I'm assuming it was the vendor, an etsy seller, that stole my picture. I can't do much about it, the picture is removed from their site because the sale is over. I couldn't find it on the etsy seller's store site. If they were still using it you can ask them to take it down, if they don't, you can involve an attorney. But what would that cost ya? The worst part is that since Holly Mathis is super awesomely talented, she has over 21,000 Pinterest followers and they've all been repinning my stolen image leading to nowhere. It's been repinned from her site over 100 times and who knows how many more from there. Would you help me by pinning my real image to Pinterest? Just click on the picture below, Pin it, and then it will lead back here. 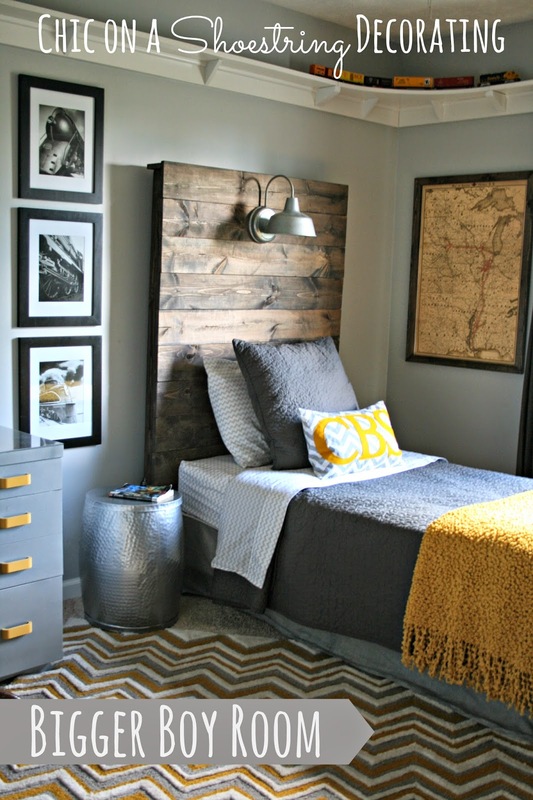 Please click here to be see how to make my rustic headboard pictured above. I know I am not the first person to have my image stolen, there might even be more of my stuff out there on the interwebs that I don't even know about. But, it stinks nonetheless. I talked about how to prevent having your blog content and photos stolen here, by making your content unable to be copied and pasted... but I stopped doing it, maybe shouldn't have. Thanks for listening to my vent and thanks for pinning my image!! I just pinned it. Sorry to hear this happened. I am sure this type of thing happens all the time but it doesn't always get caught. I have 2 boys so this pic is great to add to my Boys Room Pinterest board! Love the room! That's awful! I pinned the correct image. Can you notify Pinterest? Sometimes I get email from them saying that they had to remove an image from one of my boards because of copyrights. Repinned and asked others to follow suit. I think I might consider publishing the name of the shop that confiscated your image so we can choose to not buy from this shop. I would send a message to holly herself and ask her to repin it with the correct track back. I bet she would! great idea, I'm sure she feels your pain! That's not nice! I'll pin it properly! That's just wrong! I'm sorry this happened to your lovely snap. I pinned it and it will lead back to you. Some folks just need an adjustment - like a punch in the stomach. I've heard of this happening before and it's always sad. I pinned it. That's just kind of crappy, hate that it happened to you. I'm so sorry to hear about this...so unfair! I've pinned your wonderful room...with pleasure! As a photographer, this is something that really gets me miffed. Try photo stealers. Pinned. I love that headboard. Wow, that's ridiculous! I just pinned it with the link back to your site. Thank goodness for your friend, eh for noticing it. Kate, just wanted to let you know that I unsubscribed to your blog feed but I'm still very much following you! I'm streamlining my blog feeds to BlogLov'n so my email inbox isn't full each day. I would like to think that it was an isolated event but I am sure she is stealing photos from other bloggers too. I pinned your beautiful room right away. That's crazy! I will pin too... It was on the news where companies are stealing personal photos of people on facebook and then using them to sell diet drugs! Crazy. So sorry. Do you know who the ETSY seller was? They should learn that they ought to ask you first. Such a bummer that someone stole your photo. Your room is lovely. Pinned to my decorating board to link back to you. That is terrible! I just pinned it. Hopefully Holly Mathis will change the URL on the pin she pinned. I always wonder when I tuck a watermark in the corner if it could just be cropped off. I know some people put watermarks right across their pictures. I'm please that you have found out about this and done what you can to, if not rectify at least compensate for the damage done. Your son's lovely room is on my home decorating ideas board now anyway, every little helps. Girl, doesn't that just break your heart? I got all stressy for you just reading this post. I repinned, tweeted and Facebooked your pic! It doesn't make it all better but it may help a little. I feel for you! Someone is CURRENTLY using a photo from my blog post (http://thegilbertsonfamily.com/2011/09/12/diy-crayon-letter/) on their own Etsy listing. Seriously, the nerve! I've contact them tirelessly and have gotten no response. Etsy will not do anything either until I go through all of the legal mumbo jumbo... So sad. Anyway, I pinned your photo and I LOVE the headboard! Lots of my photos have been stolen by foreign sites, and don't go back to my blog. I don't know what can really be done about it. It's the problem of the internet. Blatant plagiarism. I wonder if some people don't realize that it is actually theft. I've been trying to always "like" a photo until I can find the source, then I will pin. It's more work and you can't categorize a "like". Some folks pin without changing the comment and that's risky too, they could be pinning comments that seem to attribute credit to themselves! Some of my comments have been repinned with no credit to me. So now, I like to write "Colleen's note" in front of my comments for those pinners that don't edit. Good luck, keep pinning, and hopefully Pinterest will start to address this problem, many artists have been ripped off. I love this room so much and I am glad it lead me to your blog:) I am doing a caterpillar room (my husbands job:) ) for my two boys and was hoping you could tell me where you got the yellow blanket and the chevron rug. I have been searching online at all my usual places and I cannot find a blanket like that:( thanks so much!